An OSSF is an On Site Sewage Facility. OSSF are underground storage facility. It is used to capture and treat waste water. OSSF are usually found in rural areas, in which city sewage systems do not reach. What are the different types of OSSF? There are three different types of basic septic systems. They are Standard Septic Systems, Aerobic Systems, and Low Pressure Dosing Systems. A typical septic stem has a septic tank (that will separate solids and liquids). The system also includes an absorption area where the liquids are treated before they are returned to the ground water supply area. A septic tank separates the liquids from the solids. The tank is buried in the ground on your property. Periodically the tank needs to be cleaned and pumped. Call us to help you with this service. Do: Have your tank pumped and cleaned on a regular basis. Do: Maintain the area in which your septic tank is located. Don't: Treat the system like a city sewer. If your system is backed up, call us today! Don't: Flush down anything else than toiler paper or waste water. Don't: Build anything over the septic system. Don't: Plant or do landscaping over the septic system. Don't: Drive heavy equipment over the septic system. 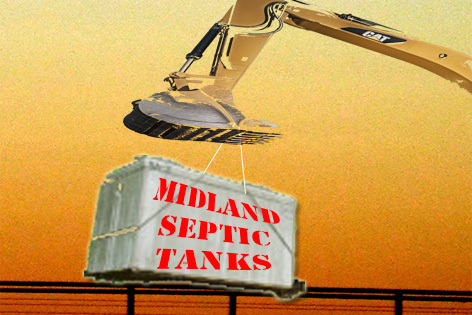 Do: Call us at Midland Septic Tanks if you have any problem at 432-741-3025.